NASA's Aqua satellite analyzed Tropical Cyclone Eliakim in infrared light and found warmer cloud top temperatures as wind shear continued to pummel the storm. Wind shear has elongated Eliakim and pushed precipitation south of the storm's center. Infrared light provides valuable cloud top temperature data on tropical cyclones. The higher and colder the cloud tops, the stronger the uplift in the storm and stronger the storms can be. Since March 19, infrared imagery from NASA satellites have shown cloud tops warming in Eliakim. Warmer cloud tops mean the storm has been weakening while being battered by strong northerly vertical wind shear. 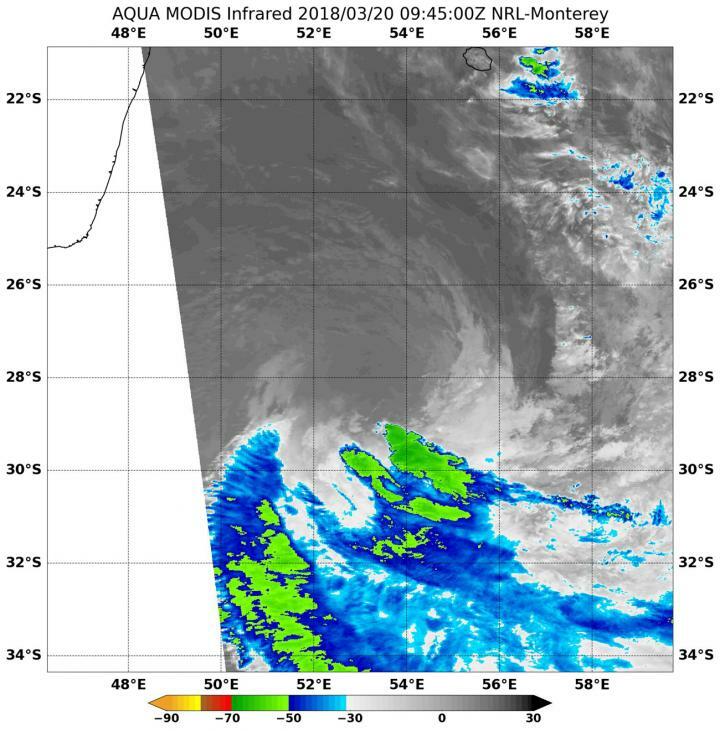 On March 20 at EDT (0945 UTC) the MODIS instrument or Moderate Resolution Imaging Spectroradiometer aboard NASA's Aqua satellite observed Tropical Cyclone Eliakim in infrared light. The MODIS data showed coldest cloud top temperatures were as cold as minus 50 degrees Fahrenheit (minus 45.5 degrees Celsius) in storms that were pushed southeast of the center of circulation. The MODIS image showed the northern side of the storm was devoid of rainfall. At 11 a.m. EDT (1500 UTC) on March 20, 2018, the Joint Typhoon Warning Center (JTWC) issued the final bulletin on Tropical Cyclone Eliakim. At that time, Eliakim was located approximately 499 nautical miles south of St. Denis, La Reunion Island. It was centered near 29.4 degrees south latitude and 54.1 degrees east longitude. Eliakim was moving to the south-southeast at 15 mph (13 knots/24 kph). Maximum sustained winds were still near 52 mph (45 knots/74 kph). Eliakim was moving south-southeast. JTWC forecasters noted "Eliakim has begun rapid extra-tropical transition and is expected to become a strong gale-force cold core low with an expansive wind field [later in the day on March 20]."